See the boxes below for details on each part of this flowchart! Start your research process by using reference materials. In a library, these are books like dictionaries, encyclopedias, bibliographies, or atlases; they will give you valuable information like key authors and texts to investigate, important theories about your topic, and keywords that you can use in more detailed searches. Don't skip this step unless you already have a really good idea of the broad picture and important players involved! 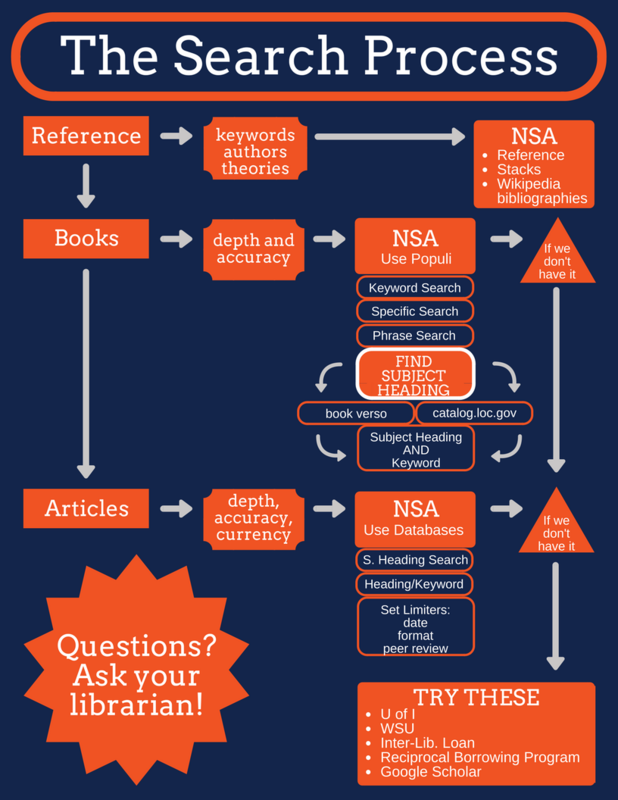 At NSA, you can use the books in our reference section to help with this preliminary research. If you aren't sure which reference books can help you, ask! If you don't see the kind of reference book you need, try hitting the U of I or WSU reference sections as well. Some reference-type books are in the Tyndale stacks as well. Try finding the general area for the books on your topic and browsing for them - look for words like "Guide" or "Companion" in the titles. Once you've tried that, feel free to venture over to Wikipedia. However, try not to rely too much on the information in the articles; they are easily changed or vandalized. Look for the bibliographies and citations at the ends of the articles instead - you may find sources there that you can follow up on yourself. Once you have a good grasp of the big picture and some recognized authors, titles, or keywords to search with, start hunting for books! Look for books that will give you deeper insight into your specific questions and have accurate and relevant information. Keep in mind that you might not have to read the entire work to find something useful; if you are writing a paper on "Hamlet," for example, flip through more general works on Shakespeare's tragedies to see if they have chapters devoted to that play. Certain books can be invaluable at this stage - handbooks, bibliographies, Oxford guides, and Cambridge companions are, as they say, the bomb dot com. At NSA, begin your book hunt on the Populi catalog. Populi unfortunately doesn't have many advanced searching options, but there are a few different tricks you can try to get more specific results. A keyword search (using keywords you filched from your reference sources) will bring up results with that word anywhere in the record - the author, title, subject, description, etc. It's not usually the most efficient way to search, but depending on how specific your topic is, it might yield results. A search limited to a particular field (like author, title, or subject) will usually get you more specific results. Type in "title:" before any book title or "author:" before any author name. You can do the same with "subject:" as well, but there are other ways to hunt for that, as you will see. A phrase search (with quotations around the phrase) is basically like a keyword search only slightly narrower. It's letting the search engine know that you want to find all the words in that phrase together in that order. One of the most important pieces of knowledge you can gain from these searches are the SUBJECT HEADINGS associated with your topic. Similar sources in multiple formats (books, articles, journals, etc.) are grouped together in catalogs based on subject headings, so if you can find a few that are relevant to your search you can use it in all kinds of different databases and catalogs. In the Populi catalog, there is a "Subjects" tab next to the "Search Resources" tab. The subjects are arranged alphabetically. Scroll through them to see if you can find relevant subjects. If you find a book in the Populi catalog that looks helpful, scroll down to the bottom of the book record. There is usually a "Subject" field showing you what subjects the book was cataloged under - and you can click on those subject links to see what else was cataloged there. If you are looking at a physical book, try looking at the verso (the back of the title page where all the copyright information is). Most newer books have cataloging and subject information there. Some paperbacks even have a general subject heading somewhere on the back cover. If you can't find it anywhere else, try looking for a subject heading on the Library of Congress website (catalog.loc.gov). You can usually find subject information on their book records! Once you have some subject headings, you can try searches that combine those headings with keywords you used earlier - that should trigger some pretty amazing results! Once you've found some books, you probably have more keywords and subject headings to use for an article search as well. Articles provide current scholarly input and can provide more tightly-focused information or arguments for your project. However, you want to make sure that you are finding authoritative pieces rather than just a random dude's blog post! Use scholarly databases rather than Google to get the best results. At NSA, you have access to any of the databases at lili.org, ProQuest's Patrologia Latina database, and several of JSTOR's databases. Most databases work roughly the same way, so you can use many of the same techniques on all of them. Do your subject heading searches the same way you did in your book hunt, as well as your subject heading and keyword searches. You should have enough specific terms now to get some decent results even before you try the fancy stuff! Remember to limit your results. Often helpful are format or accessibility limiters, as well as "peer-review only;" that should give you the cream of the crop. JSTOR has a magnificent (and entertaining) overview of how to conduct advanced searches on a journal database, and if you are having trouble finding what you need you really should read it. It will make you an instant research ninja. Your goal: to find authoritative, relevant, and scholarly contributions to the topic of inquiry. SEARCH - Know how to craft a good search, whether you are searching a library catalog, a journal database, or the internet at large. FIND - Know how to locate the resources you've discovered in your search. 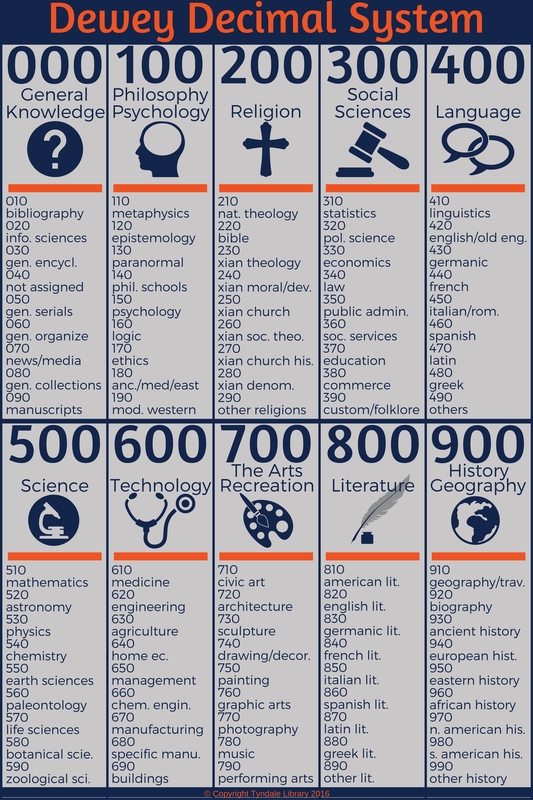 This may be as simple as being familiar with the Dewey Decimal System. 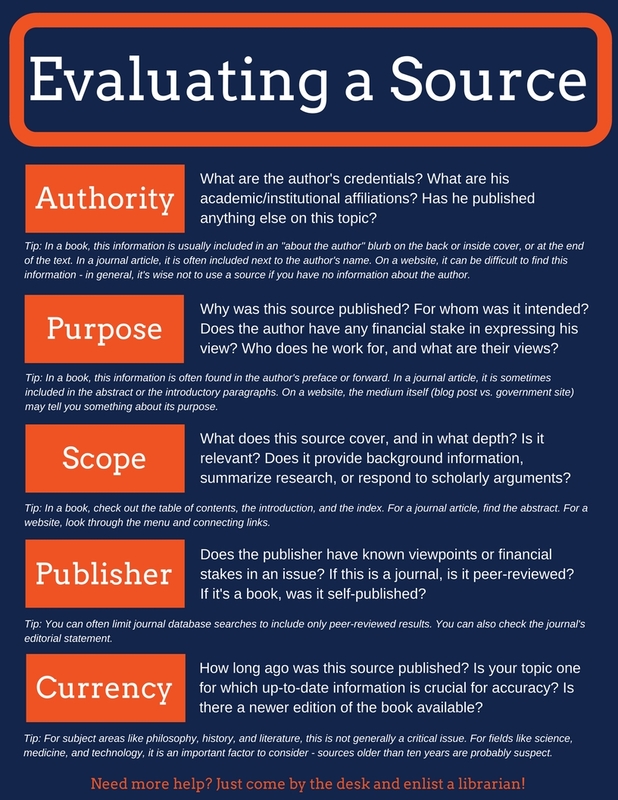 EVALUATE - Know how to tell which books are worthwhile once you've found them, which journals are authoritative, and which websites have good information. The boxes below and to the left should go into each of these steps in more detail. I asked my professor for good leads on sources, and boy was I glad I did. He told me to find a copy of "A Beowulf Handbook," which (among other things) gave a very thorough overview of basically everything that had ever been written on Beowulf, divided up into different chapters by subject. All I had to do was find the chapter on "Digressions and Episodes," and there at the beginning was a beautiful annotated timeline telling me that A had thought this, B had thought that, C had said the other thing. I could look up a little paragraph on each entry with a short summary on each work's main point. It was the perfect way to get a broad picture of what had already been said by whom, and when. It also gave me a great idea of where to go next. Certain works had been quoted, argued with, or written about far more than others - so I made a list of the big players and their books. Klaeber, Tolkien (obvs), Brodeur, and Bonjour seemed to be the most widely recognized on the topic of the digressions and structure of the poem, so I hit the library looking for them. As I read them, I read their footnotes. Yes, I actually read the footnotes. These were important scholars, so who were they quoting? What had influenced their opinions? What books were in their bibliographies? What articles had they cited? I found several more interesting leads just from chasing the footnotes. This required trips to several libraries (one of them in another town), but getting the right sources made a big difference. I knew I was on the right track, was listening to the right people, and was keeping track of what each of them said. Making these notes as I went along got me to well over my word limit before I had even started on the paper itself! Once you've found some results from your awesome research ninja searches, you still need to evaluate what you've found. Some material is not as helpful, relevant, or scholarly as it looked from the search box! Here are some criteria to help you assess. The talented library team at Kuyper College is responsible for the structure of the ALEA system. Many thanks to them!